Good news! 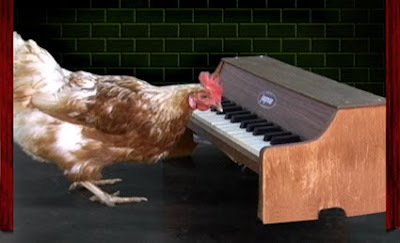 Beanie the piano playing chicken is alive and doing well in her southern California home. Nearly a year had elapsed since we’d last heard from James, Beanie’s trainer. The same amount of time had passed since Beanie’s Blog was last updated–May of 2008. So naturally, we began to wonder. Could something have happened? Did Beanie finally pluck her last note? You can catch both Beanie and James on the Mad City Chickens DVD as they both make an appearance in the film. And keep a watch for updates once Beanie begins posting on her blog again. It’s good to know you’re doing fine Beanie!